SOG Bowie Knife 2.0. Modern technology and materials make it a top - notch working knife! 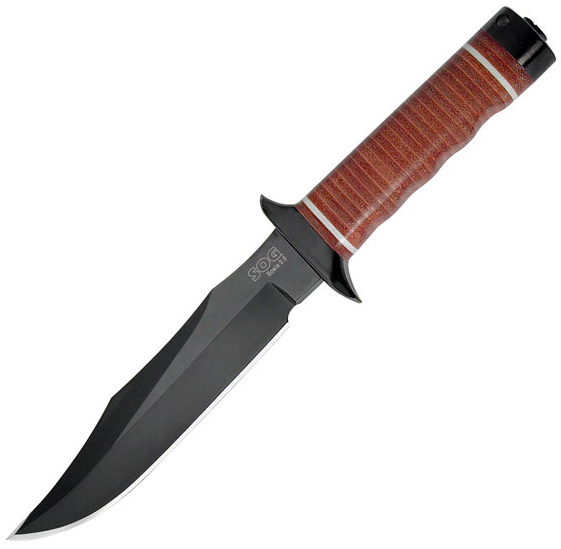 Based on the original Studies and Observation Group knife secretly developed and used in the Vietnam War by the 5th Special Forces, as well as other elite soldiers. These individuals were specialists in reconnaissance, infiltration, and operations behind enemy lines. The SOG Bowie 2.0 has become a classic with unparalleled quality. The sculpted crossguard, deep hollow grinds, precision detailing, TiNi coating, and faceted tip are all unmistakable signatures. An all-around warrior for just about any mission! Now THAT'S a knife: Blade length: 6.4" x .23"; Overall length: 11"; Weight: 12.0 ozs. ; Edge: Straight; Steel: AUS 8; HRC: 57-58; Handle: Epoxied leather washers; Finish: Hardcased Black TiNi; Sheath: Leather with sharpening stone. Order yours today! WARNING: You must be 18 or older to purchase Bowie / Fighting Knives. Bowie / Fighting Knives cannot be shipped to Marin, Napa, Ventura and Yolo counties, CA; CO; CT; AL; FL; Peoria, IL; TN; D.C.; MA or Puerto Rico. Please check your State, County and City laws for restrictions before ordering Bowie / Fighting Knives. SOG Bowie Knife 2.0 .